1. Mix marinade ingredients together and marinate shrimp for 1/2 hour to 2 hours. 2. Broil shrimp 4 inches from heat for 2 minutes. Flip shrimp and broil on other side until done (about 2 minutes more). Cool shrimp slightly. 3. Gently mix avocado with lime juice, cilantro, salt & pepper. 4. 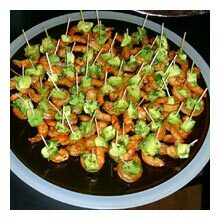 Skewer an avocado slice then a shrimp with a toothpick. Repeat with all shrimp and arrange on a platter. Shrimp can be cooked ahead through step 2 and refrigerated for several hours.